By the end of this Python lesson, you’ll be able to quickly count and compare records across a large dataset. You’ll be able to look at web traffic data and compare traffic landing on various pages with statistics and visualizations. As you analyze web traffic data in these next few lessons, it’s important to keep in mind why you’re analyzing this data. Web traffic data presents significant value to a business. The practice of web analytics focuses on assessing and improving the company’s traffic and engagement by analyzing and understanding how people view and traverse the website. These are what you should hunting for in the data. As a data analyst or data scientist, you might be responsible for these types of analyses on your company’s web traffic data. Learnings from this data could potentially inform business decisions, such as where to increase spending on ads, when to send promotional emails, and what kinds of blog posts to publish. In this lesson, you’ll be working with the Watsi pageview data, which we first saw in the last lesson. In the previous lesson, you selected rows, columns, and records in that dataset. But how many times does a particular value appear in the same column? Simply counting is often the fastest way to get information about a dataset in order to start formulating hypotheses—it’s something you’ll do at the beginning or nearly every exploratory analysis. For categorical columns such as title, referrer_domain, website_section, or platform, you can aggregate the number of times each value occurred using the .value_counts() method. This will technically work for columns containing numerical values as well, but there are better ways to handle that (covered in later lessons). In Python, this statement is executed from left to right, meaning that the statements layer on top, one by one. data['title'] Select the “title” column. This results in a Series. .value_counts() Counts the values in the “title” Series. This results in a new Series, where the index is the “title” and the values are how often each occurred. The series is ordered in descending order from most frequently occurring title. [:20] Selects the first 20 most-frequently occurring titles from the last Series, created by .value_counts(). This results in yet another Series—the one which is finally displayed. As you learned in the first lesson, everything in Python is an object, so each of these steps would give you an object. In this case, each of the objects is a Series. But as you might have noticed, it can be useful to combine the statements on the same line. add to the same cell and re-run it to inspect the output. It comes down to personal preference. If you’re exploring, it may be easiest (and easier to read later) to edit a cell and rerun it. Keep in mind that, as you learned in the first lesson, you should always be able to run your notebook from top to bottom and achieve the desired results. Make sure as you re-run cells that they still work properly in order. Visualizing data is useful because it allows you to see relationships in data in a fast, intuitive way. It’s especially helpful in exploring data and deciding what to dig into next, because it can point to places where there may be significant patterns. In pandas, the .plot() method allows you to create a number of different types of charts with the DataFrame and Series objects. Bar charts are a visual way of presenting grouped data for comparison. You can visualize the counts of page visits with a bar chart from the .plot() method. To define the type of plot you want, you’ll use give .plot() a keyword called kind=. In this case, you can use the keywords bar or barh (for horizontal bar chart). For other keywords to adjust the size, color, title, and more, see the documentation. Additional charting features are also covered in an upcoming lesson. Among Watsi pages that people landed on, the most popular page is the homepage. What you’re looking at here is the distribution of frequently visited pages—a display of several possible values in the title column and how often they occur. As you can see, traffic volume was significantly lower for the 2nd highest-ranking page than for the top page. The drop from the second to the third is pretty substantial as well. Five pages down the list and traffic is looking pretty small by comparison. This is called a logarithmic or long tail distribution. It’s a common pattern on the web, where the most popular pages will be visited much more frequently than the next popular page (in this case, 2 times more). What were the 15 most popular website sections? Bonus Points for creating a plot! Profiles were more popular than the homepage (the blank value - the homepage doesn't have a section), but not by too much! If you take a look at the Watsi website, you'll see that many pages are profile pages. 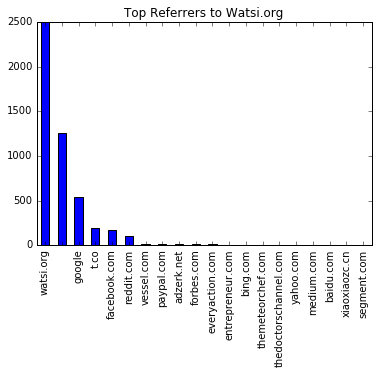 What websites most commonly referred users to Watsi's pages? Create a frequency distribution bar chart. Hint: referrer_domain is a simplified version of the referrer column. Domains like "google.co.uk" and "google.com" have been grouped under "google". Note that "t.co" is Twitter's link shortener, so those referrals are from Twitter. Here, we used the title= keyword to give the graphic a descriptive title. 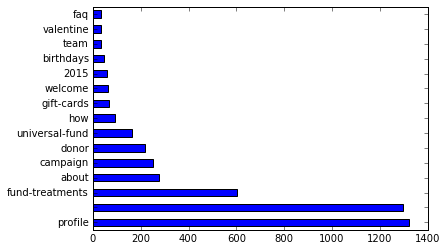 Note that the second highest contributor doesn't have a domain—what does that mean? Notice the second highest bar in the chart? It’s missing a label. This is because the referrer column is missing values. This isn’t because we failed to record where those page views came from, but rather, we don’t know the source of those page views. Maybe someone received a text message with a link, or typed it straight into the browser. We can’t know for sure. But we do happen to know that Watsi gets significant traffic from email they send out directly, and from other types of social sharing. If you were an analyst for Watsi, this would be a great place to dig deeper, find other useful data, and investigate where this mysterious website traffic is coming from. 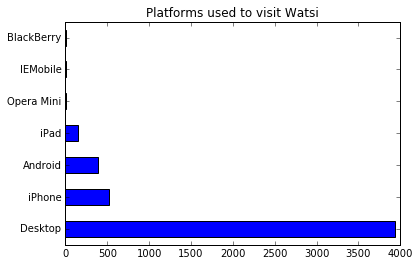 When people visited Watsi, what devices were they using? Plot the relative counts of pageviews from each platform. People were predominantly using a desktop or laptop computer, as it turns out. For a different kind of website such as social networking or gaming, we might expect more users to visit on mobile. In the next lesson, you’ll learn how to filter and view subsets of data.